Trifle is one of those timeline recipes that we all recall from our childhood and associate with parties, Christmas and special meals. 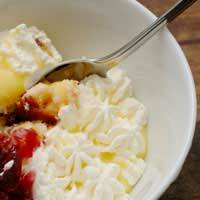 There always seems to be a lot of palaver involved in the preparation of a trifle and this can put some off from enjoying this dish. But, there are ways and means to make it an easy trouble free recipe that even the novice cook can master. With a trifle the trick is to prepare some of the components ahead of time. You do not want to be faced with a jelly that has not set or hot custard with only minutes to go before the meal is served. When making your jelly melt the jelly cubes or granules in only a quarter of the required water. Make sure that the water is boiling hot and stir rapidly so that the jelly or granules dissolve completely. At this point add the rest of the water but take it from the fridge so that it is as cold as possible. For added flavour use the fruit juice that has been drained from your tin of fruit and make up to the required quantity with ice water. Some people use ice cubes in the jelly but of course this will slow down the preparation time as you will have to wait for the ice cubes to melt. Use ready prepared custard from a can or carton for speed rather than make it from scratch. If using a packet mix make it at least half an hour before you need to assemble the trifle to give it time to set. It is possible to enjoy a trifle without piling on the pounds. Use sugar free jelly and low fat custard and make sure that the cans of fruit are in natural juices not syrup – better still use fresh fruit. Instead of cream try low fat vanilla yoghurt for the topping. One can of fruit cocktail in fruit juice. Four tablespoons of sweet sherry. One carton or can of readymade custard. Place the trifle sponge fingers into the bottom of a large clear bowl. If need be break them in pieces to fit but try not to overlap them. Drizzle the sherry evenly over the sponge fingers. Open the can of fruit cocktail and drain. Save the juice to add to the jelly mix. Scatter the fruit evenly over the trifle sponges. Prepare the jelly and pour slowly over the fruit. At this point place the bowl onto the freezer to aid the jelly to set quickly. Make sure that the bowl is places on a flat surface. When the jelly is set pour the custard on top. Chill in the fridge.Stir the cream so that it is nice and thick and carefully spread over the custard. Place back in the fridge. Before serving either grate or shave the dark chocolate over the trifle to decorate. Note: For a more festive and colourful topping take a look in the baking section of your supermarket for gold and silver cake decorations or hundreds and thousands. Slices of mandarin oranges, glace cherries or fresh strawberries also make ideal decorations. Very useful info and I will put it to good practice thanks.